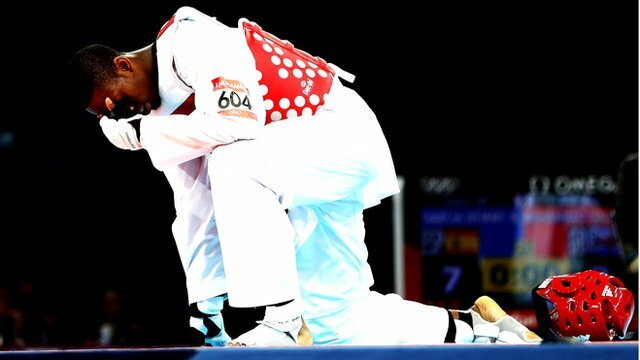 Lutalo Muhammad became the first British man to win an Olympic taekwondo medal, beating Armenia’s Arman Yeremyan 9-3 to take bronze. The 21-year-old lost in the -80kg quarter-finals to Nicolas Garcia Hemme, but was handed a repechage place once the Spaniard made the final. Muhammad was a controversial choice for Team GB, picked ahead of world number one Aaron Cook. But his third-place finish will go some way to silencing the critics. Muhammad received hate mail following his Olympic nomination and admitted some of the messages were “hurtful”. However, he responded to the disappointment of his loss earlier in the day to beat Iran’s Yousef Karami 11-7 in the first round of the repechage before securing a medal with victory over Yeremyan. Muhammad insisted he had not felt additional pressure at being selected over Cook, saying he had taken a “nothing-to-lose” approach. It was the second medal in as many nights for Britain’s taekwondo fighters following a surprise gold for teenager Jade Jones on Thursday.